A Ryerson student is planting the seeds to make rural farming attainable in Toronto’s urban landscape. Ben Canning, a third-year business management student, co-founded Farmium, a company that builds green roofs on top of city buildings. Through the use of a vertical gardening system, he is able to grow plants upward in order to save space. Canning was recently named the Student Entrepreneur Provincial Champion from Enactus Canada, a student-led organization for innovative businesses based out of Toronto. “The idea of being able to change the age-old concept of agriculture and how things are grown allows us to become sustainable, efficient and actually make rooftop farming viable,” Canning said. Farmium also aims to tackle the issue of food transportation to city centres. According to an environmental study by Queen’s University, the average distance fresh produce has to travel to get to southern Ontario is over 4,000 kilometers. Along the way, the food loses some of its nutritional value and the means of transporting the food results in carbon dioxide emissions. “So that means we are outsourcing an economic opportunity,” Canning said. Canning’s business model centres on the ability to grow food locally, raise its nutritional value, reduce CO2 emissions and make money for business owners. 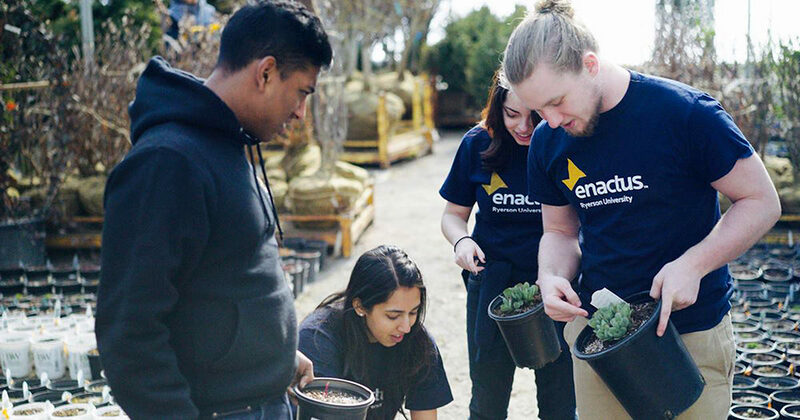 “He’s created this innovative business model that solves an environmental issue while doing it in an economically sustainable way,” said Nicole Almond, president of Enactus Canada. Ryerson has implemented one green roof, and many businesses are following suit. The Andrew and Valerie Pringle environmental green roof atop the George Vari Engineering building was built in 2004 and converted into a farm by Rye’s HomeGrown in 2013. In 2009, Toronto became the first city in North America to pass a bylaw issuing all new buildings over 2,000 square feet and above six storeys to include a green roof. Although Ryerson’s green roof uses a traditional horizontal farming method, Farmium uses an advanced approach with automated hydroponic towers that don’t require soil or dirt. Hydroponic towers are water-based gardening systems that recycle water through the tower in order to feed the plants. The towers each stand five feet tall with a plastic mesh material squished inside, similar to a dish scrubber but more porous. This material hosts the plants and acts as a soil. The water is poured at the top of the tower, goes through the mesh material, and is absorbed by the plants.The remaining water goes through a pump and is then reused. Farmium plans to equip the green roofs to the building’s amenities in order to provide the towers with heat, water and electricity. The hydroponic system is able to grow anything, except for produce that grows under the ground. Farmium’s system also aims to be completely digitized, meaning a computer can accurately forecast the day a plant has been harvested and the nutritional requirements needed and will be able to feed the plants on its own. By installing sensors onto the hydroponic towers, the Farmium team will be able to monitor temperature changes and water flow. Currently, the team of four co-founders are in the prototyping stage of their hydroponic tower system. Along with Canning, team members Alif Rurul and Lediona Canellari are also Ryerson students. Daniel Tabak, the team’s fourth co-founder, is in high school. Canning will continue on to the regional competition for Enactus Canada March 11.